There are only about 740 mountain gorillas remaining in their natural habitat. These gentle giants are found in the Virunga Mountains, a chain of volcanoes with altitudinal ranges of 3,500m – 4,507m. This is the oldest Park in Africa. Presently, Rwanda not only enjoys the best security in the region but also has the easiest access routes for visiting the mountain gorillas. Gorilla trekking remains one of the most exciting attractions in the East African region, with Rwanda having ten habituated families in the famous Volcanoes National Park available to tourists. This park is less densely forested than Uganda’s Bwindi Impenetrable National Park and also less steep, making the trek much easier. There are ten Gorilla families available for tourist contact and eight families for research only. In order to minimize behavioral disturbances to the gorillas, only 8 people are allowed to visit each of the families and for a period not exceeding 1hour. These limits serve to protect gorillas from the risk of exposure to human-borne diseases. Only eight permits are available for each gorilla family and therefore a maximum of eighty permits are available per day. For this reason, you will need to make your booking at least six months ahead of your chosen date. Each permit is issued to a particular name and passport number, to prevent permits being purchased in bulk by individuals and resold at higher prices. On the appointed day, guests must register their presence at Park headquarters, where permits are matched up with passports and individuals and groups are matched up with a Gorilla family. This procedure is strictly adhered to. There are no rain checks if you fail to show on the day of the permit and no refunds will be given. For this reason we suggest that you plan on trekking for two days (not just one) in case of a late arrival in Rwanda or a health issue that may prevent you trekking on the first day. This will also allow you to visit two different Gorilla families on two separate days. We also recommend that your Gorilla trek be undertaken following a Kenyan safari, as this will help guests with altitude acclimitisation. It is truly exciting to get up close and personal with these gentle creatures. Please note that due to Park regulations, all visitors must be over the age of 15 years. Volcanoes National Park (Parc Nacional Des Volcans) – Rwanda currently has 10 habituated gorilla families that can be visited. Gorilla trekking is a very special experience and it is important to preserve these fantastic, endangered animals, so only a limited number of permits are available in each park. Every visitor must obtain a permit before they can embark on a trek, so it is essential to book well in advance. Permits need to be paid for at the initial booking stage and are non-refundable. Anyone who embarks on a gorilla trek must be in good health, as reaching the gorillas in their natural habitat can be tough, arduous and wet. To reach the gorillas requires trekking through thick forest at heights of up to 3,000m over sometimes difficult terrain. 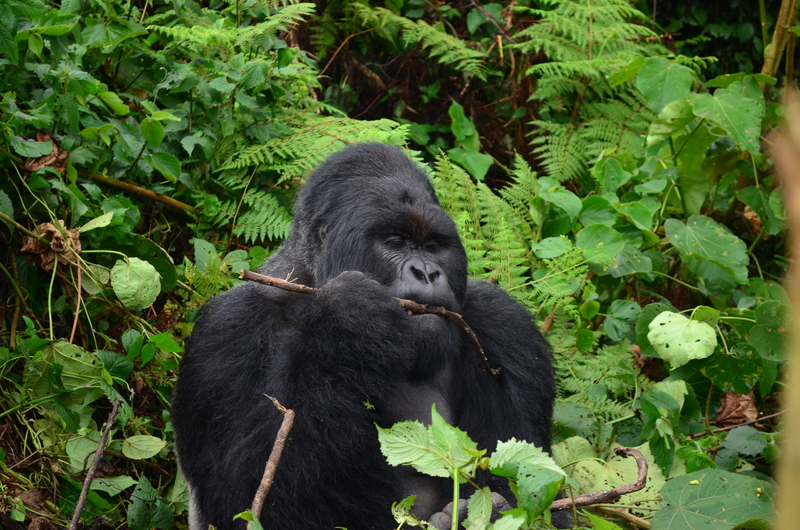 If on the day of your trek you are sick with a cold, flu or other contagious illness, visiting the gorillas will not be permitted and you may not be refunded the cost of the trek. Only one hour is allowed with the gorillas, at a distance of at least 7 metres. 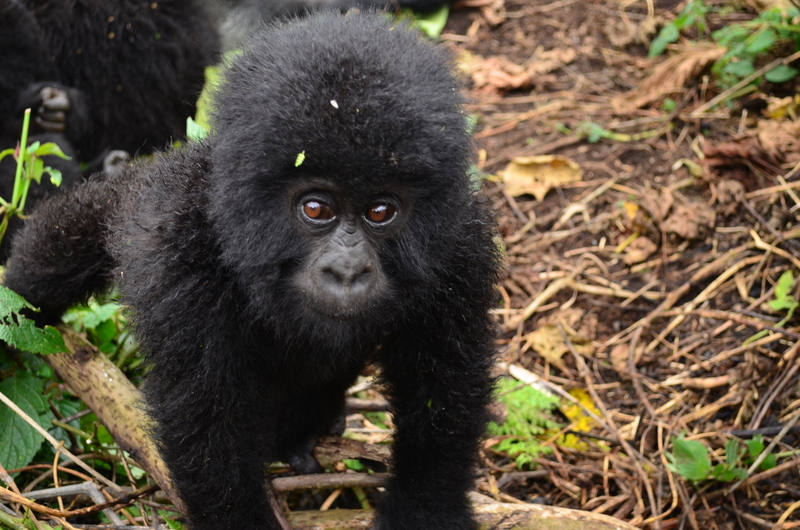 Throughout the trek you will be accompanied by a ranger who will explain the rules and take you to the gorillas. Ø If it rains, which it frequently does, treks will still take place, so waterproof clothing such as a raincoat or jacket is useful. NB: It is generally quite cold (in Ruhengeri), particularly in the evening, so warm clothing is advised. Ø No venturing behind thick shrubs. You may surprise a gorilla. Ø If a nettle stings you, do not cry out, scream, shout out loud or make any sudden moves. Ø If a gorilla charges or vocalizes, do not look directly at it. Stand perfectly still unless the guide asks you to crouch or move back. Ø Keep a minimum distance of 7 meters from the gorillas. You may not approach the gorillas but they may approach you if they decide to. RESTRICTIONS: Please note that children under the age of 15 years of age are NOT allowed into the park for the Gorillas trek, and children under 12 years of age are not allowed into the park for the Golden Monkeys, but are allowed into the park for other activities such as nature walks and visiting the Diana Fossey Tomb, provided they are accompanied by an adult.